We are starting this week with new NZD/USD sell orders. One of our core views this week is NZD weakness. When the RBNZ last met, they refused to acknowledge the improvements in the economy at the time and instead warned that “uncertainties remain and policy may need to adjust.” They didn’t feel that the pickup in inflation was durable as there is no evidence of accelerating wage growth. 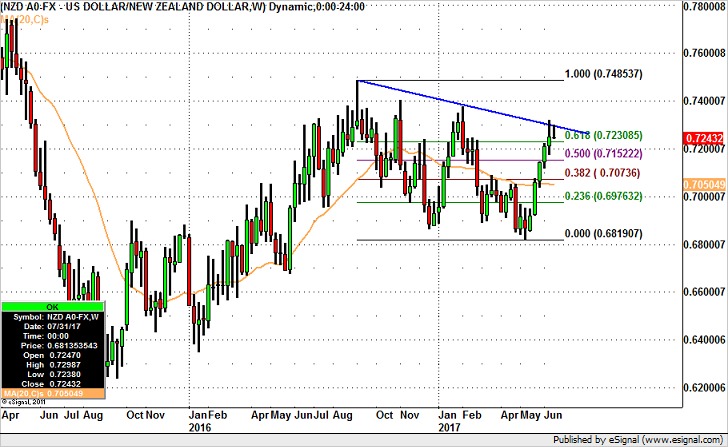 Since then we’ve seen a lot of unevenness in New Zealand’s economy and that combined with a stronger currency should keep the RBNZ cautious, leading to a top in the overbought NZD. We have chosen to sell NZD vs. USD because Fed President Dudley spoke this morning and his optimism + hawkishness brought new life to the greenback. This should have additional continuation as investors leverage his comments for direction.